A picture (or a photograph) is worth a thousand words, they say. In my new world of garden blogging, I recently discovered the most fun way to capture our gardens without a single shutter click of a camera! I'm so excited about this new creative outlet that I am rendered...well...almost speechless! Almost. 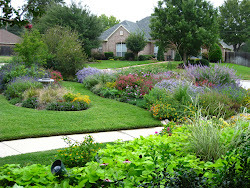 Check out the Gardening Gone Wild blog for a complete run-down on how to do what I am now affectionately calling "garden scanning." You might even want to enter this month's "Picture This Photo Contest." (See the GGW blog for contest details.) 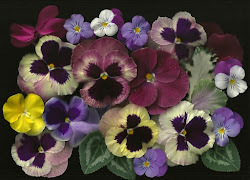 Visit Ellen Hoverkamp's website to see some absolutely gorgeous examples of garden scans. 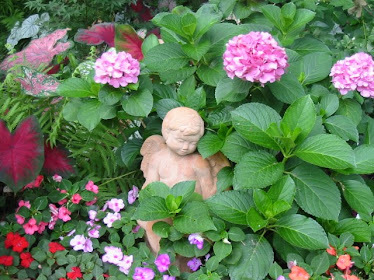 Go out to your garden and gather a bunch of blooms and foliage. 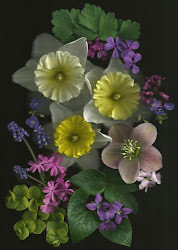 Lay them on your scanner face down, layering and arranging as you would a pressed flower arrangment. 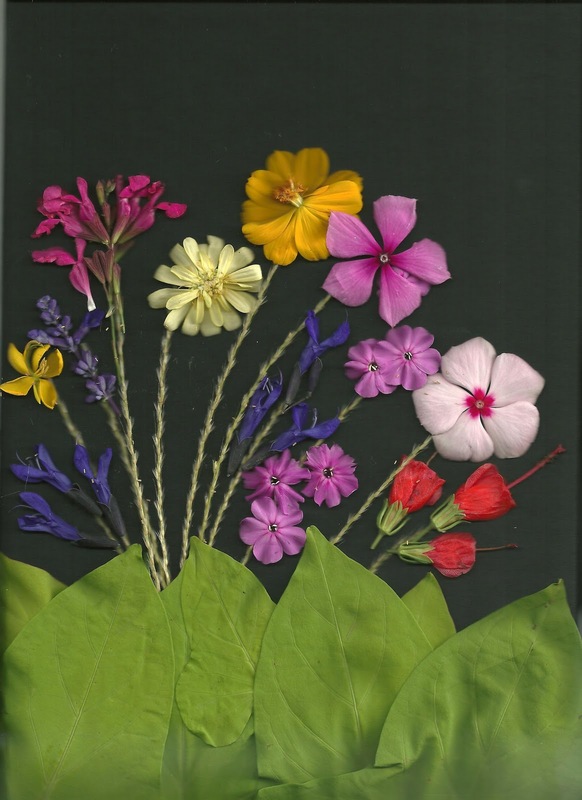 In this scan I arranged all of the flowers, and then I spread a background of Margarite Sweet Potato vine leaves over the whole screen. Can you name all of the plants in this "photo"? 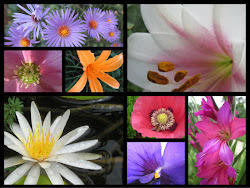 Hint...check out my What's Bloomin' post from September. with "stems" from a plume of my Miscanthus sinensis 'Adagio' grass. The blooms pop against the dark background. 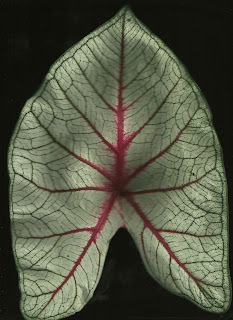 A single leaf of White Queen Caladium shows amazing detail. 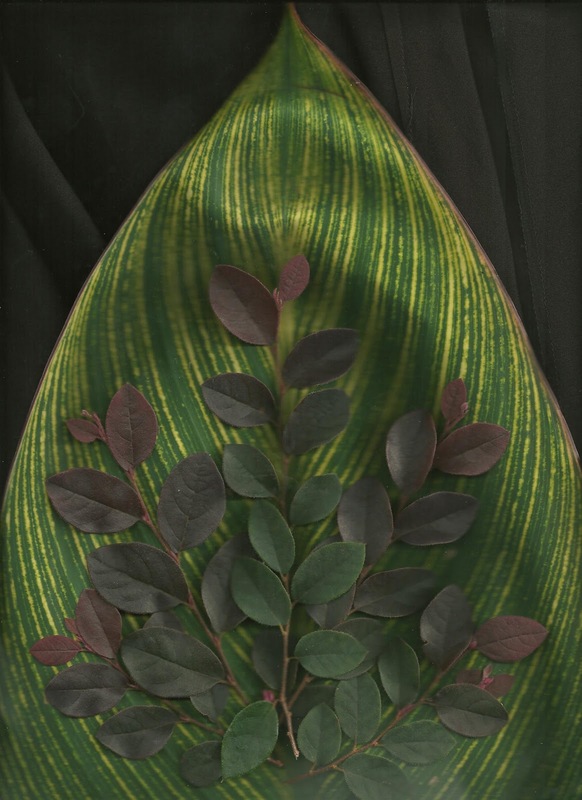 Loropetalum leaves layered over a Bengal Tiger Canna. burgundy foliage contrasted with lime green or variegated foliage. 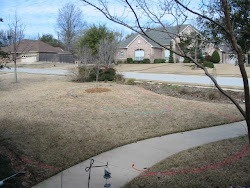 So try your hand at a little "garden scanning." 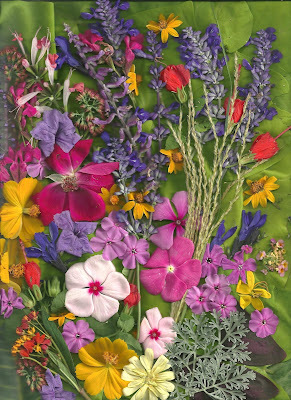 Oh, and one other little note... after you're done scanning your precious posies, you might need to wipe off your scanner to remove any plant debris or tiny critters that crawled in to get their picture taken, too. Wow - I just love those scans. Beautiful art. I can't wait to try this technique, perhaps with some colourful fall leaves. :) (I've chosen your blog to highlight in my sidebar this week...I hope it brings you lots of new readers!) I look forward to exploring your blog further. 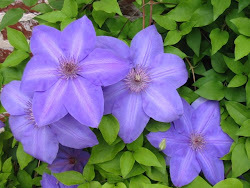 Nancy, thank you so much for visiting my blog and featuring it on your blog. I have added your blog to my blog list, too. I guess we'll call that recipro-blogging :-) I am excited to try some fall leaves on the scan, too, but I'll have to wait until late November or December for that. I'm planning to do a scan a month to capture my garden at a moment in time. Fun stuff! Blog on!! You've achieved some amazing art with the scanner. I can't wait to try it as well. Would never have imagined you could get such beautiful results.... and thanks for the handy hints. I didn't think to put the lid down on the scanner to flatten them. It makes a really cool effect. @McGregor'sDaughter: Thanks for visiting my blog! I have tried lowering the lid or placing a black book over the arrangement and then scanning. Does give a different effect, but doesn't work with some plants. Lots of fun things to try. My most recent scans I just turned the lights off to get the black background. I tried different fabric coverings but was never happy with my results. I, too, am scanning in the dark. Thanks for all the information. I really love the way your scan turned out! The wavy stems from grasses is very creative. I'm with you ~~ one of my favorite combinations of colors in the garden ~~ just about anything contrasted with chartreuse.